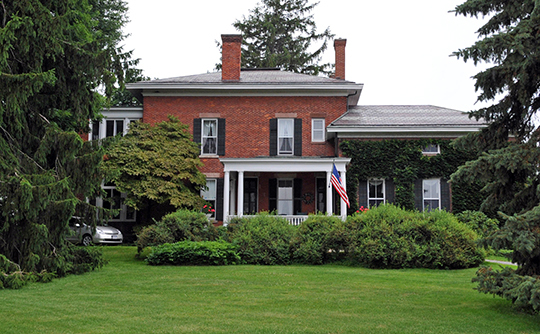 Wheatland Town Hall is located at 22 Main Street, Scottsville NY 14526; phone: 585-889-1553. Photo: Romanta T. Miller House, ca. 1870, 1089 Bowerman Road, Wheatland, NY. Listed on the National Register of Historic Places in 2014. Photographed by User:Jerrye & Roy Klotz, MD (own work), 2008, [cc-by-4.0 (creativecommons.org/licenses/by-sa/4.0/deed.en)], via Wikimedia Commons, accessed February, 2017. Incorporated as the Town of Inverness in February of 1821, the name was changed in April to Wheatland. It has been suggested that John Garbutt, an Englishman, had sufficient influence to change the "Scottish" name. The first white person who owned and occupied land in what is now Wheatland was Ebenezer Allan, or as he was more commonly designated, "Indian Allan." Allan was from New Jersey, and during the war of the Revolution, if not an active participant in the struggle, was evidently a sympathizer with the British cause. This fact may account for his withdrawing from civilized life and seeking the seclusion of the wilderness. It may also at a later period, have influenced him to follow the example of Butler and the Johnsons of the Mohawk Valley, to seek more congenial society across the Canadian border. Near the close of the war, probably in 1781 or 1782, Allan appeared upon the banks of the Genesee at Mount Morris, and found employment upon the lands of Mary Jemison, the "White Woman of the Genesee." He here formed his first matrimonial alliance with Sally, a native of the forest. In 1786 he came to Wheatland and by a title obtained from the Seneca Indians, took up his abode upon the flats between the present location of the village of Scottsville and the river, building a log cabin upon the rise of ground on the north bank of the Oatka, about one hundred rods from its confluence with the Genesee. Upon the arrival of the Sheffers in the fall of 1789 they found this cabin occupied by Allan, his Indian wife Sally, two young half-breed daughters, Mary and Chloe, and a white woman, known as Lucy Chapman, whom Allan had induced to take a half interest in his marital affairs. His sister, the wife of Christopher Dugan, a lady of some culture and refinement, having availed herself of the educational advantages of her New Jersey home was also temporarily, a member of his household. Allan was engaged in agriculture, in stock raising; and as Indian trader. He had a herd of cattle upon the flats, a market for which existed at Fort Niagara, a post still occupied at that time by the English garrison. The Sheffers were seeking a location for a home, and were pleased with an exhibit of the products of Allan's farm, and particularly with the fine condition of his live stock, while Allan had lived here about as long as his restless spirit would allow him to remain in any one place. Under these circumstances a bargain was quickly consummated, and the property of Allan, real and personal, was transferred to Sheffer. During the winter of 1789 the two families, jointly, occupied the cabin, and in the spring of 1790 Allan, with his harem, removed to the Falls of the Genesee, where he erected the rude mills that have become famous in the annals of Rochester. In the early part of the 19th century Allan removed to Canada West, and died there in 1814. When the Sheffer family came to Wheatland in 1789 it consisted of but three persons, Peter Sheffer, Senior, an aged father, and two sons, Peter, Jr., aged twenty eight years, and Jacob, six years younger. In the spring of 1790 the family of Jacob Schoonover, which numbered among its members a daughter of 18 years, settled upon the banks of Dugan Creek, three miles south of the village of Scottsville. For a decade of years after the advent of Sheffer, the settlement of the neighborhood was very slow. The accession of families exceeded but little the number of years that intervened before the close of the century. Christopher Dugan, Jacob Schoonover, Isaac Scott, Hinds Chamberlain, Jesse Beach, Cyrus Douglass, Reuben Heath, Joseph Morgan, Francis Albright, Frederick and Nicholas Hetzler and John McNaughton (with the first installment of the Scotch Colony in 1799) are nearly all of those who came before the close of the 18th century. During the first decade of the Nineteenth Century the tide of immigration set in with a stronger current. The opening year brought an accession to the Scotch settlement. Alexander Thompson, Donald and John Anderson, John Mc Pherson, John Christie, and John Mc Dermid, settled on the Creek road and in the vicinity of Beulah. Located in other parts of the town were John Smith, Christopher Laybourn, John Finch, James Wood, Newman Warren, Samuel Cox and sons Joseph, Isaac and James; John, William and Philip Garbutt, John W. Lawson, Donald Mc Kenzie, John and Robert Mc Kay, Powell Carpenter, Thomas Stokoe, Darius Shadbolt, John Sage, William Reed, William Lacy, Harris Rogers, Thomas Mumford, David and Elisha Farwell, William Shirts, James Fraser, George Goodhue, Joseph Blackmer, Rufus Cady, Joseph Tucker, Andrew Cone, Benjamin Irish, and others, affording unmistakable evidence that the scattered families were soon to reap the social and educational advantages incident to a more thickly settled community. Prior to the construction of the Erie Canal a portion of the surplus products of the farms and mills of Wheatland was drawn by ox teams to Hanford's Landing, north of Rochester, and there shipped by river and lake to Montreal. George E. Slocum, Wheatland, Monroe County, New York: A Brief Sketch of its History, Isaac Van Hooser, printer, Scottsville, 1908.